I will try and post on the way to Reno and back, we will seeeeee! We left Scott City, Kansas at 6:45 am cst and arrived in Grand Junction, Co.at 4:30 pm mst. Here is some of what we saw!! 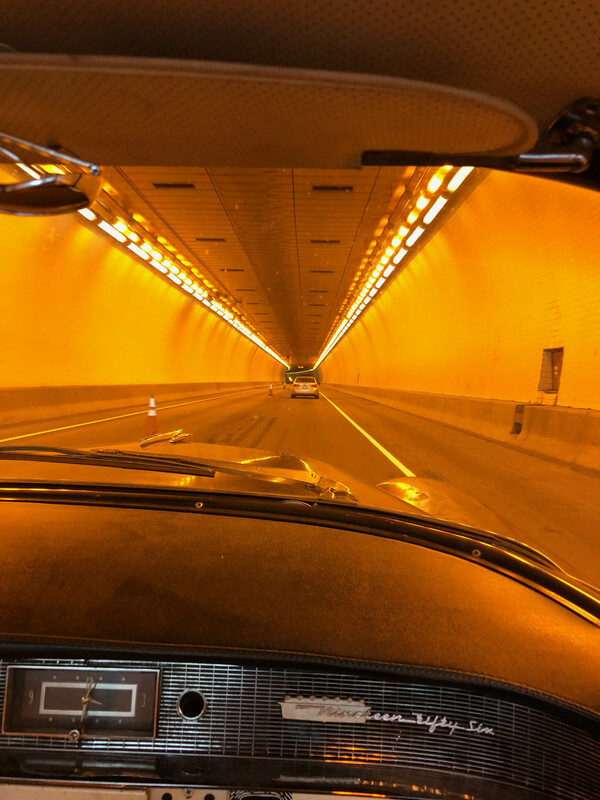 Now you know what the Eisenhower Tunnel looks like from the front window of the 37.
and Veteran's Tunnel through the windshield of the 56 Cadillac. 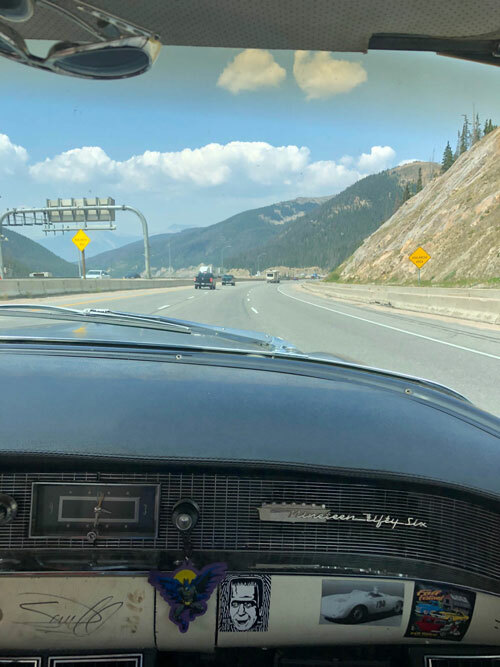 On down the road to Silverthorne and Frisco. I got Chuck and Dee to buy a burger at Frisco, Co. (Breckenridge area). This was in the park accross the street. Now for the view along the road from Frisco, Co. on I-70 to Grand Junction, Colorado, from the Window at 60 to 75 mph. I was tracking this old car thinking I was catching some Okies but??? When we got to Grand Junction, we put the cars to sleep together. They were tired. They went 540 miles the frist day. This is the morning of August 3, 2018. 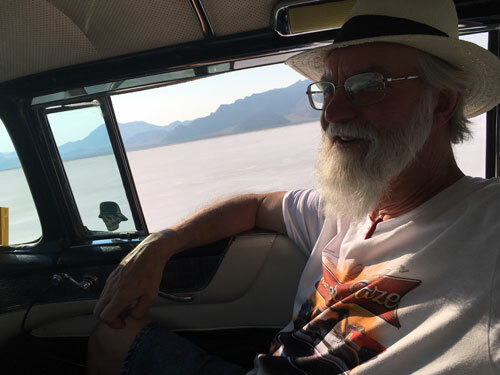 If all goes well we hope to be in ELY, NEVADA, AT HOTEL NEVADA tonight. We left Grand Junction about 9:00 am headed west through Utah starting with I-70. Lets take a look. Next we stopped at the Utah Visitor Center about 40 miles inside of east Utah border. By the way we did not walk those paths you see. We want to conserve the landscape for future visitors. Back to pictures from the window, along Utah I-70. Cars at another Viewing Area, not sure if this is where Dee made a connection with a Native American who promptly sold her a bracelet. Now on down I-70. At this point Jake missed the sign that said no services for 101 miles. This means no potty, no food, no gas and no cold beer!. Luck had it I carried an ice chest and had overdrive. Take a look at the scenery out the window. After that 101 miles we had to swithch to HWY 50 at Salina, Utah. That road took us north to get around this mountain. Learned later that the mist look you have seeing is smoke from forest fires. We went 30 miles north to Scipio, Utah and got on I-15 to go south back to HWY 50 and on to Delta, Utah. From Delta it is 83 miles to the Nevada border with NO SERVICES and here is what you see at that point. After that 83 miles you will find the town of Border, Nevada which is in Utah and Nevada. This is the first Casino in Nevada. Yes you was seeing most of Border, Utah - Nevada. Then we has some fun with the signs, Utah, Nevada and HWY 50. 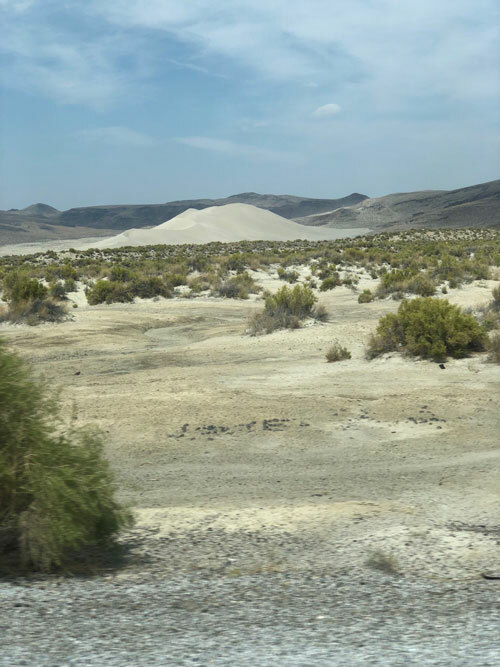 We did arrive at Ely, Nevada at about, 5:30 pst on August 3, 2018 after driving 430 miles. We have driven more than 970 miles to date. Lets see if I can show some of what me saw including the HOTEL NEVADA in which we stayed the night. The casino across the street. Then the famous HOTEL NEVADA built in 1929. Above is the plaque naming famous visitors of the Hotel. As we left, they were removing the plaque to add Jake, Chuck and Dee. 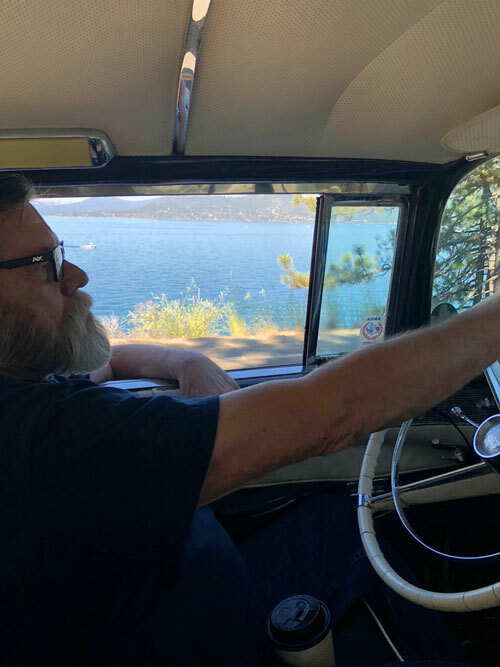 I will be back when we get on the road on the 4th August. YES, I KNOW THIS POST IS OUT OF ORDER. ABOVE I AM TALKING ABOUT AUGUST 4 BUT IT IS ACTUALLY AUGUST 5. THAT MEANS HAPPY BIRTHDAY TO MY DAUGHTER, JESSICA!!!!!!!!! Since her birthday is before mine every year does that mean she is older than me???????????? HAVE A GOOD ONE. Think about it at one time I was 30 times older than Jessica, now I am less than twice as old, she be catching up???? Think about it Mark a Banker should be able to figure that out!!!! Ok, back to the trip. From Ely, Nevada we took on the portion of HWY 50 referred to as THE LONLIEST ROAD IN AMERICA (from Border, Nevada to Carson City, Nevada) Remember from Delta, UT to Border, Nev we drove 83 miles with no towns. At the beginning of the Lonliest Road you can get a little book named " the Official Nevada HWY 50 Survival Guide". The the road is 334 miles and you go through 7 towns. There ain't much on the road there but we took some pix. After 78 miles you come to Eureka, Nevada. This town contains a well used and preserved Opera House. Eureka, Nv. has more and right next door to the Opera House is the Jackson House Hotel and Saloon. From Eureka we drive 70 miles to the next town Austin, Nevada. All was going on as usual when I get a call from Chuck complaining that the road is really rough. When the Cadillac rides rougher than the 37 Chevy there is a problem. After 30 or so miles at a slow pace we found a place where we could easily change out the tire. Wayne's Tire and Service was much help with tools. If you look cllose you see Bobby looking out but Bubba the cresent man is out of site. The rough ride was caused by a separating tread. Austin, Nevada has the Stokes Castle built in 1900. After a 1/2 mile of a climbing dirt and narrow road you come upon this. From the Castle you can see where we are heading. The next segment of The Loneliest Road is from Austin to Fallon, Nev. (112 miles) the first attraction is a tree, that is not marked and I missed. Yup, that is the world famous Shoe Tree. 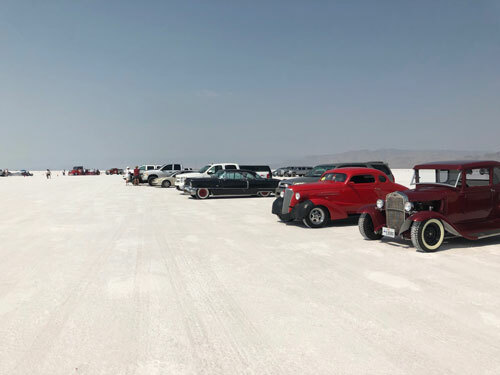 After that you see a Nevada version of the salt flats with whirlwinds. We went on to Carson City, Nevada for the night. We covered 335 miles for the day. The next day we decided to go see a portion of Lake Tahoe. 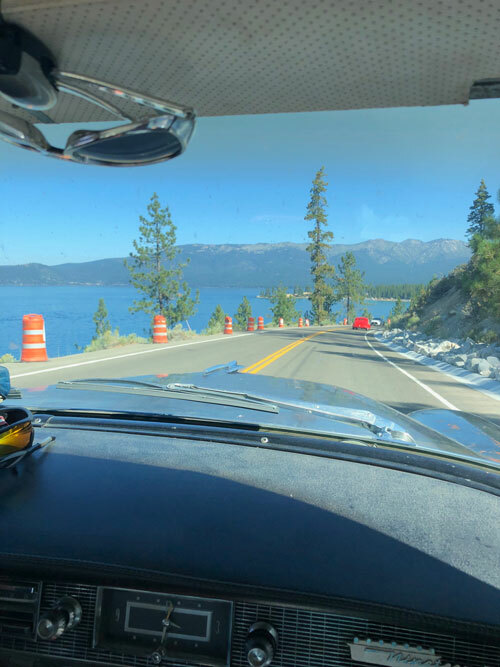 We left Carson City and wen to North Lake Tahoe to Incline Village, Nevada to Kings Beach, California to Truckee, California to Reno, Nevada a tour of only 75 miles. This is were Jessica can insert pix of Lake Tahoe from Dee, if she sends them. Thanks. Lake Tahoe or atleast the northern western part is amazing and a must see. This picture do not show the real facts because there was not place for us to stop and take pictures. That place is cool even with the guard rails. Ok, the only cars you have seen are ours. That will now change. We arrived in Reno Sunday August 5, 2018 and went to the Pre-Party at Rancho San Rafael Park. I bet these are new to your eyes. There were about 300 cars at this pre-party. The above pix are from Sunday August 5, 2018, eventhough I am completing the post on Tuesday, August 7, 2018. Cars will be the subject now. On Monday August 6, 2018 we went to Peppermill Casino to a gathering of several hundred cars. Wait for it. We are staying at the SilverLegacy right next to the Circus Circus. Lets take a look at the Peppermill Crusie In on Monday, August 8, 2018 above and below. Some stuff Dee Dee and I thought was cool. One puchy salesman. Oh My God are those ants drinking. Dee Dee and I liked them. Who want some???? 37 Chevy Convertible and HMMMMMMMMMMMMMMM! 1959 Caddy with Stainless top. We were lurking over to the side. Hard to see but that is two-toned. Red and black. Not the best way to end the day a chopped 56? Well we move to Tuesday, August 7, 2018, this is the day the out of town people actually get to register. That is done at the Grand Sierra Resort. This is not like NSRA or Goodguys registering at another location. At Hot August Nights they are actually running 3 to 5 locationsthe same time. We stayed for several hours after registering and here is a sample of the cars at the Grand Sierra Resort. In my mind probably the best I have seen so far. All three (3) of these cars are from Kansas. Guess which one (1) was trailered???? I went to the Atlantis Casino and saw these. Gots some wheels on that. I nice pickup. The truck not the broad in the background, Rick! Starting Wednesday, Summit sponsored the Downtown Event. Five blocks of Virginia Street, Casino were blocked off for registered vehicles. If my date is correct this was August 8, 2018. Two more pix for EIK. See 60's Mercs can be cool I am just ahead of my time. Do not see many of these. I went down to Summit Downtown Show and Shine at 9:30 am spent the day watching young ladies who thought I was something special, go in and out of the Casinos. I also shopped the pawn shops. I had a good parking place at the end of the walk way between Circus Circus and Silver Legacy. It was much cooler that way. When they broke the show and shine up there was a cruise two cars wide from Fifth Street to First Street on Virginia Street, Casino Row. I could not take pix of the Cruise because I was in it. There were atleast 1000 spectators. I have not been talking about it but the fires to the west of Reno --have resulted in much smoke. For a couple of days you could not see the mountains. Take a look at the best circumstances I have seen. I am organizing the car show pix from our last tour of the show on Thursday, 9, 2018. Ok, Ok, Ok, I know the above is a little overkill. 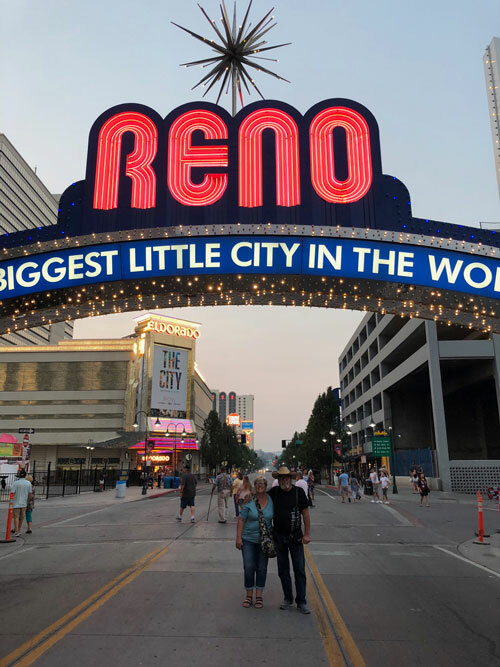 But when you get up early enough to get both cars of your group under the Biggest Little City sign on Virginia Street, in Reno on Hot August nights you can complain. Tell me how many times you have seen a 1969 Grand Prix SJ restored. Chuck went on to another place so I had the Biggest Little City Sign to myself. Nope not done with Reno. I went on to the Atlantis Casino and later will try to take pix of Downtown Cruise. Sart with Atlantis Casino on August 9, 2018. I do not know why there are more 37 Chevys here than I have seen at any show. How many 57 El Camino's have you seen? Unusual Colors????? Now lets try pix of the Downtown cruise. 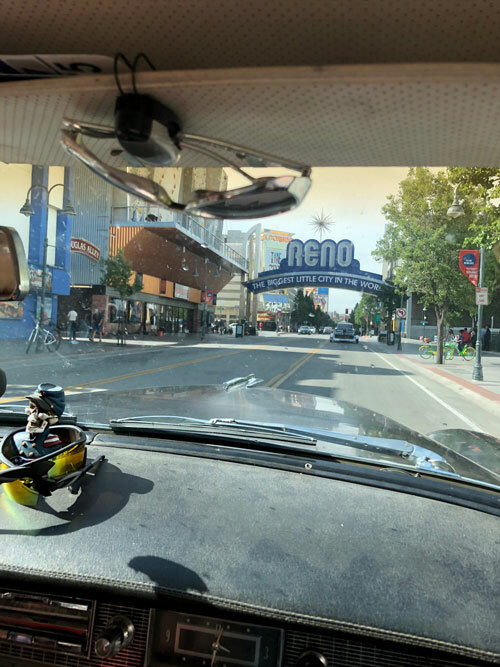 The Downtown Cruise starts on 5th Street and Virginia between Silver Legacy and Circus Circus. That does it for Hot August Nights eventhough we did not have time for all of the 240 events. I did not make it to the swap meet, car aution, drifting, moto-cross and many more events. but we are still 1200 miles from home so it is time to move. We were told there were 6,000 regisered vehicles. No motorcycles. We are not done. We now drive 400 miles to Wendover, UT. 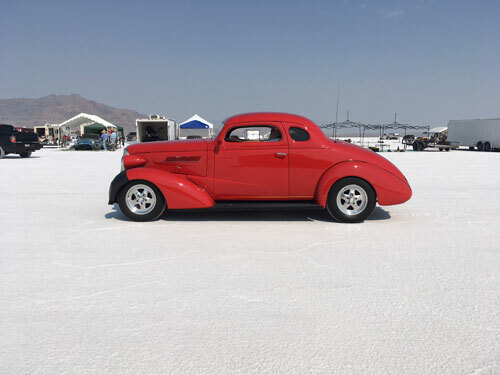 NEV. for the BONNEVILLE NATIONALS SPEEDWEEK. There is not much between Reno and Wendover but you can still see the smoke from the California Fires. There were numerous of these nice bridges crossing !-80. We could not figure out their purpose since there were no exits nor roads crossing. Our best guess was that the Nevada Taxpayer pays for nice cross walks for wildlife? 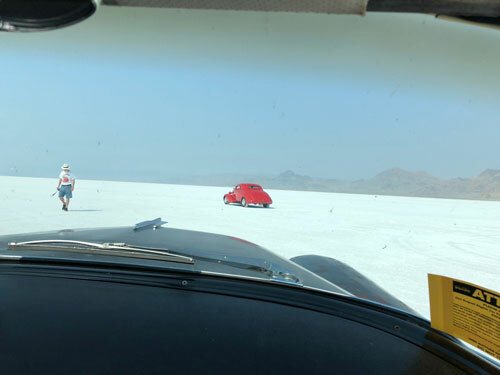 We arrived early enough at Wendover that Chuck were not ready to quit so we went to the Salt Flats about 6 miles east of Wendover. What a first impression! I am not sure you will able to see it but in about in the center of this pix way out there is some stuff that is not just salt. We estimated that to be about 5 miles away. People were setting up the pits for the time trials. You will see that closer soon. In above two pix you can see the road to the pits. The payment ends then you are driving on a salt highway divded by a blue line with a few speed limit signs. Just before that we met a person we named cake lady. Chuck made me promise not to tell anyone that he and I ate cake from the same fork. Yes that is a close up of the surface. This is what you saw about 5 miles away. Necessary to avoid Yellow Snow, GET IT??? 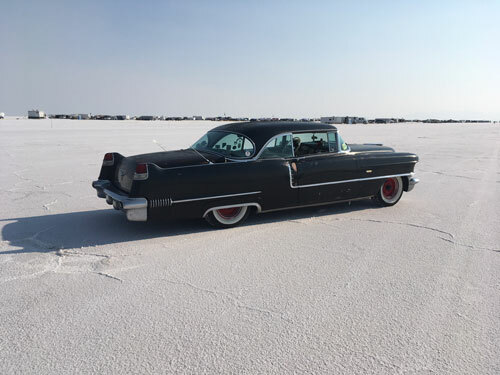 On to a few pix of the Caddy on the salt. Before we quit we had to take pictures of "Wendover Will". Many of you will remember seeing him after a cheap flight to gamble in Nevada prior to Kansas Casinos. Yes we went back to the opening day of the Speedway. I will be back. Here we go starting with the Pits and then back to the starting line. 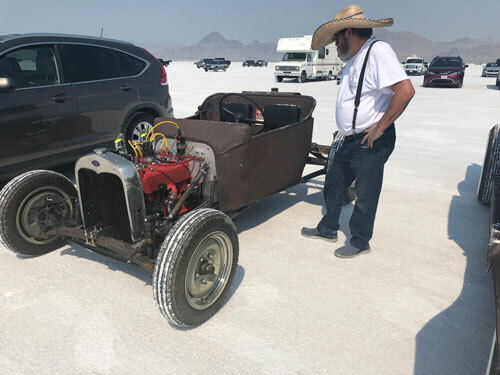 I did not find this car but just the sign "300 mph flathead is impressive"!!!!!!!!!!!!! You cannot keep those lawyers out of anywhere. They said they expected 6 to 7 hundred race teams. Don't worry I did not get a picture of every team. Hell the pits are at least a mile long. Looks like some idiot parked in the middle of the pits. In fact they do not care if you drive through and actually took pictures of us rather than running us off. Do not worry the government will get ahold of this good time and make a bunch of rules. How about a Dodge and Studebaker. Guess which one will race, I can't. There was all kinds of transportation, including bicycles. On the way to the starting line we could not resist the urge to take pictures of us. Hey, some dummy forgot to put down his radio antenna because he way listening to 83.9 am, where they were broadcasting racers names and results. Records were being set. 450 mph piston engine. That white, white, white makes a great background for pix. Now we head for the starting line!!!!!! It is out there and on its way. It was explained to me you are not supposed to be on the other side of the yellow caution tape, but I wanted a pix right at starting line. On the line but only one goes at a time. Just climb in and go 300 mph. 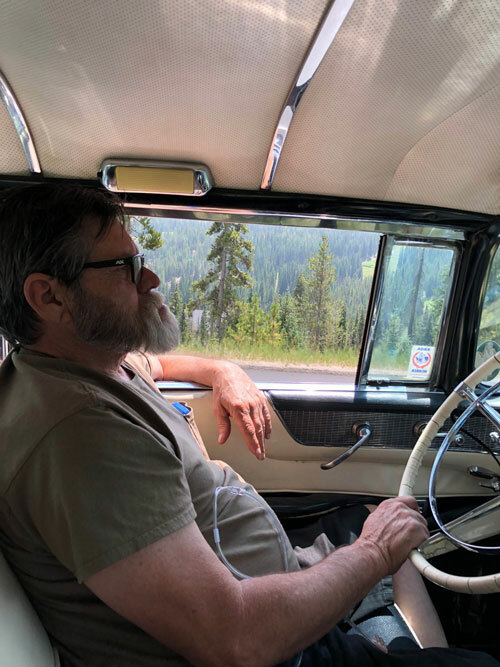 We got back in the cars and drove another 410 miles to Rawlins, Wyoming. Not much at all between Wendover and Salt Lake City. Came through the traffic in Salt Lake City to a tough climb and then on the way down saw some good landscape. The above was in Utah, after this we come to Wyoming. Then a surprise in Rawlins, Wyoming. As Chuck walked away I think I heard, "WHO THE HELL WOULD DO THAT!" Then it went to hell with construction and a detour down I-25 that I did not enjoy. About 480 miles later I was home.